Arrival at Istanbul Airport , Upon arrival transfer to the Hotel Santa , Checkin & remainder of the day at leisure. This evening (1900hrs) proceed for the Dance & Dinner Show, Istanbul by night means floodlit mosques, a fabulous Turkish dinner and a spectacular floorshow with bejeweled belly dancers. It's the ultimate Turkish experience!On your evening out in Istanbul you will be picked up from your hotel and privately transfered to a first-class restaurant for dinner. The fabulous four-course dinner includes a Turkish dessert, followed by an exotic floor show. You'll be entertained by belly dancers and an Anatolian cultural folklore group.Overnight at Istanbul. Breakfast at the Hotel. 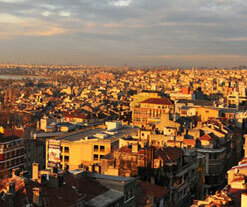 Proceed for a full day guided tour of Istanbul with Lunch.This tour starts at Hippodrome Square. See the Obelisk from Egypt, the Serpentine Column from Delphi and the fountain of Willhelm II. Continue to the Blue Mosque, one of the largest of Istanbul. It is one of the principal adornments on the skyline and also famous for its blue tiles and 6 minarets. Then visit St. Sophia, one of the most magnificent Byzantine churches, and nominated the 8th wonder of the world by many historians. After lunch continue to Topkapi Palace (including the jewellery section), the imperial residence from which the Great Ottoman Empire was ruled but today a museum holding large collections of Japanese and Chinese porcelains and displaying holy relics. 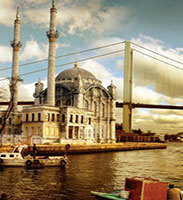 Proceed to Suleymaniye Mosque and Little Hagia Sofia. The tour ends at the Grand Bazaar tempting souvenir-hunters with its rich collection of precious handmade carpets, jewellery and leather.Overnight at Istanbul. Breakfast at the Hotel. Day at leisure. Pickup from Hotel & drop to the Airport & board the flight for Kaisery (Capadocia), Upon arrival transfer to the Hotel, Checkin at the Hotel Overnight at Capadocia. Breakfast at the Hotel. Proceed for full day tour of Capadocia. 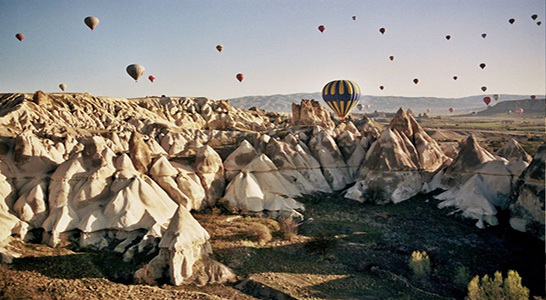 Discover Cappadocia's fascinating natural and archeological wonders on this full-day tour. 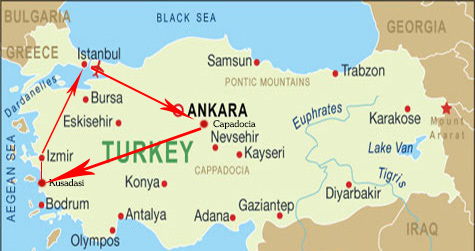 Visit Özkonak Underground City, a unique site on the slopes of Mt Idis, and learn about its built-in communication system and strategic features that helped watch for Turkish enemies. See amazing volcanic structures in Devrent Valley and Pasabag (Monks Valley); see the rock citadel of Uchisar, the tallest point in Cappadocia; the remains of rock-cut churches in the Open Air Museum in Goreme; and enjoy a pottery-making class in Avanos. Evening at leisure, Overnight at Capadocia. Early breakfast at Hotel. 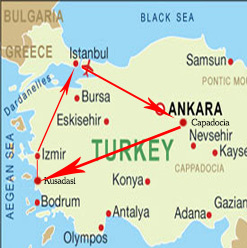 Pick up from Hotel & transfer to Airport & board the flight for Izmir via Istanbul, Upon arrival transfer to Kusadasi Checkin at the Hotel Hotel, Overnight at Kusadasi. Breakfast at Hotel, This morning (1000hrs) proceed for tour of Discover the magic of the ancient ruins of Ephesus and the House of the Virgin Mary on this day trip from Kusadasi. Visit the Temple of Artemis, one of the Seven Wonders of the Ancient World and one the best-preserved ancient ruins in the Mediterranean. See the Great Theater and the Library of Celsus. Sample Turkish delicacies during lunch, then discover the House of the Virgin Mary, the place where Mary lived her final days.Enjoy pickup from your Kusadasi hotel and relax on the drive to Ephesus. When you arrive, stop at St John's Basilica on the top of Ayasuluk Hill. Visit the basilica and see the 4th-century tomb where the remains of the saint are said to be housed.Next, travel to the ancient city of Ephesus, an important center of early Christianity. Ephesus was one of the seven churches addressed by Christ in a vision, according to the book of Revelation. With your guide, visit the Temple of Artemis, one of the Seven Wonders of the Ancient World, then see the Great Theater, the Library of Celsus and many other well-preserved ancient temples.Take a break to enjoy a delicious lunch of Turkish cuisine at a local restaurant, while your local guide explains interesting facts about Ephesus and its surroundings. After lunch, visit the House of the Virgin Mary, where she spent the last days of her life. The cottage has been a pilgrimage place for many centuries, and was authenticated by Pope Paul VI in 1967. Next, relax on your comfortable coach on the drive back to your hotel. Overnight at Kusadasi. After Breakfast , proceed for full day Tour of Pamukkale , Visit the archaeological site of Pamukkale and see its extraordinary white travertine rock terraces cascading down from the crumbling city of Hierapolis. On this full-day trip from Kusadasi, you'll walk around the incredible UNESCO World Heritage Site with your guide, learning about the rock's formation and history. Then head to the ancient city of Hierapolis for a refreshing dip in its naturally formed bathing pools before taking a walking tour around its evocative ruins.Numbers are limited to 14 on this small-group Pamukkale trip, ensuring a more intimate experience at this archeological site.After a pickup from your Kusadasi hotel, head inland to Denizli Province to visit Pamukkale -Turkey's most incredible natural wonder. Meaning 'cotton castle,' this stunning UNESCO World Heritage Site consists of dazzling white travertine rock terraces that seem to flow down 656-foot (200-meter) cliffs. From a distance, the travertine terraces almost look like snowy cliffs or frozen waterfalls, but in fact they are mineral deposits from Pamukkale's hot springs.Walk around these fascinating rocks and see the naturally formed bathing pools while learning about their geology from your guide. Views from Pamukkale are unforgettable - see the white travertine terraces contrasting with brown mountains in the distance, and then walk up to Hierapolis, the ancient Greco-Roman city with crumbling ruins and geothermic bathing pools. Enjoy time at leisure here, and be sure to bring your bathing suit as the pools are definitely worth a dip (entrance fee is at your own expense)! Relax in the warm natural springs that are separated by ancient columns, and then visit a caf for lunch before meeting your guide for a leisurely walking tour around the ancient city. Take in its impressive Classical ruins, such as the necropolis (Roman burial ground) and the vast Roman theater that was capable of seating more than 12,000 people. See St Philippe Martyrion (also known as the Basilica of St Philippe) and learn about this important early Christian sanctuary before returning to your coach for the ride back to Kusadasi. 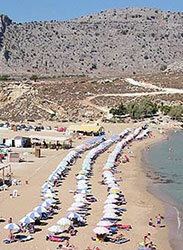 Overnight at Kusadasi. Breakfast at the Hotel. Checkout & transfer to the Airport , Board the flight from Izmir to Istanbul , Upon arrival transfer to the hotel .This afternoon proceed for a visit to the Egyptian Spice Bazaar which is full of the mystical aromas of various spices and colourful shops selling fruit, vegetables, flowers, fish etc. Next we board our boat for a cruise along the Bosphorus, the waterway separating the two continents of Europe and Asia. As we travel, you will have the chance to see the European style palaces of the Ottomans and the palaces of Dolmabahce and Beylerbeyi, in striking contrast to some of the modern villas that line the shores. Evening at leisure. Overnight at Istanbul.